"In seven years of going to these fairs, we haven't once brought home a fish," I said to Fran, bragging a little. We were watching the first children leaving the Fall Fair, loading onto the shuttle with fists wrapped tightly around the tops of leaky plastic bags, hapless little fish invariably named "Goldie" circumnavigating their watery interiors. I commented on how their hours in plastic bags had to shorten their life spans. Fran said she knew some whose fair fish lasted years. I said that while that may be true, I never planned to let my own children in on that possibility. An hour later, I broke away from my shuttle post to join Agatha briefly at karaoke, where AB was onstage, and pPod was in queue. There, on the bench next to her, at 2 o'clock in the afternoon.. an afternoon not really due to end much sooner than 4... were fish. Two. In baggies. She looked at me, saw my skepticism, and dared me to deny Patrick this small victory. "See Mama? 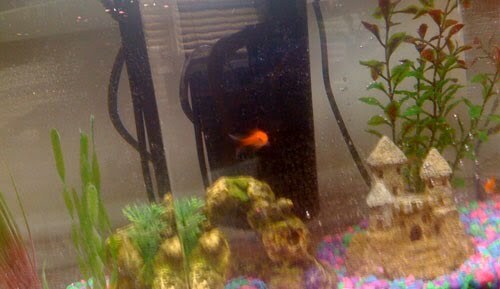 Now Annabeth has her cat and Sebastian has his cat and I have my FISH! Lightning and Bolt! Lightning is the bright one." He beamed. I had no room to argue with either of them - Patrick, SO pleased to imagine sharing his home with his new finny friends, and Agatha, tethered out of kindness and necessity to my hyped-up, sticky-fingered five-year-old for what would be some ten hours of the day. Agatha stopped at the pet store post-fair and helped Patrick select, and then purchased, extravagant accommodations. No stranger to sociological studies, and a caregiver to all, she would ensure these particular young ones were afforded every opportunity for success. Tank, filter, goldfish conditioner, gravel, a castle. Shuttle-duty complete, I collected fish and tank and son and spent an exhausted hour setting up their tank (no fishbowl for these fair fish!) cursing under my breath all the while. Patrick said, quietly, "they're mine, right Mama? All mine?" and I melted a little. We filled it, added drops to the water, floated the bags to acclimate. Patrick was uncharacteristically still, mesmerized. It didn't register when Patrick, at 6:15 Sunday morning, woke me to say "Mama! I fed them! Just one flake each like you said. Lightning is still sleeping but Bolt ate his!" It did later, though. Hours later, church and errands later, I approached the aquarium with knowing dread. And there he was, bobbing in the filter flow. Dead. We buried him, said fishy prayers, sprinkled water over his grave. I reassured Patrick that the living fish was Lightning, not Bolt. That in fact, his 'favorite' was still fine. Sebastian, the ten-year-old skeptic, positioned himself in front of the tank later saying, "this is so depressing, Mom. You know I'm just sitting here watching this other fish die." Lightning (formerly known as Bolt), swimming along just fine, and chewing on another flake, looked hale and hardy. I tsked at Bass for his pessimistic outlook. Gav had gotten home from his trip in time to take the Littles all to Annabeth's lacrosse game, to give me time and space for a leisurely lunch with a traveling friend. After delivering Tarra to her Phoenix-bound plane, I came home to an empty house and went straight to the tank. There he was. At the bottom of the tank. Twisted sideways in the plastic foliage. Bobbing in that telling way. It was blatant hypocrisy, since I can vividly remember hearing of friends' parents doing both such things when I was a child, and being horrified at the dishonesty, the betrayal. In this role, years later, it seemed the only obvious option. At the pet store, I stood in front of the tank stocked with hundreds of 30-cent fish, all looking exactly like Lightning (and somehow not at all). Phil talked me out of them. They die, Phil-the-professional said. They all die. They pee through their skin, he said. And you can't keep up with the ammonia. Better you take two female bettas. Something that will live. Males would kill each other, and you don't want dead fish again. And look! They have bright colors. Even the females. And they still have fluttery fins, even though they are the less showy of the genders. They come with a two-week warranty, even. If they die, reassured Phil, just bring back the receipt. We'll replace them. I bought a bluish betta and a reddish betta and betta conditioner and betta food, and a net - just in case. I stopped by the bookstore where the stalling was happening and broke the news to Patrick. I brought him to the car and showed him the new fish. His adjustment was immediate. Names were a setback, since he wanted super heroes, and the fish were girl fish. But he puzzled through it. Violet and Lava (Violet from the Incredibles, and Lava from Shark Boy and Lava Girl) appear to be thriving. They flutter and they sooth. And we think we'll make it past the warranty. Either way, I bet it's not the last we see of Phil. The only thing more impossible than being a child, is being a parent. Beautifully told.